Koh Yao Noi Island is situated in the Bay of Phang Nga in Southern Thailand and even though the island is only a one-hour boat ride from the tourist hub of Phuket you will feel as if you're a thousand miles away. 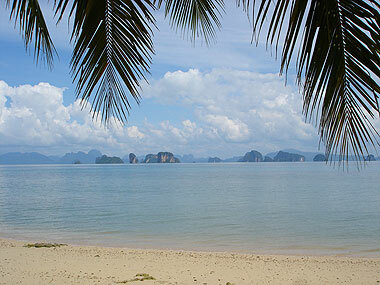 There are no loud bars, no high-rise hotels, just a handful of bungalows overlooking the Andaman Sea. Not only is this island affordable, it's an untouched paradise. The traditional way of life on Koh Yao Noi Island has remained virtually unchanged. 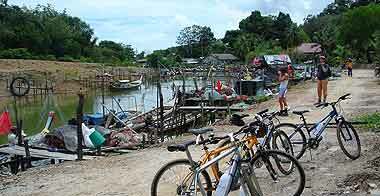 The main road snakes through rice paddies, fishing villages and plenty of secluded beaches. The best way to explore it is on two wheels. Any person with a good condition will have no problem to finish this tour. The average of speed cycling is 18-25 km per hrs. Most of the cycling follows roads with little rolling terrain and some short off-road tracks up and down hill. Some experience will help, but anyone in good condition can enjoy this ride. 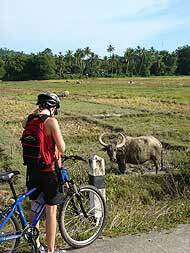 You will enjoy various types of landscapes and get in touch with local people as our lifestyle Bike Tours. Surface: village road up and down hill. Time: Apx 8.00 a.m. - 18.00 p.m.
Tour info : 8.00a.m-18.00 p.m. We will collect you from your hotel in Phuket and you will receive pedalling and safety instruction. You will then head to pier and load bicycles on the boat. Join the traditional boat with local people to really get the Phuket experience. After, arrive at the pier and we will start bike riding around towards North-West and pass by local villages and pristine beaches that provide a spectacular view of the islands. The people of this island lead a simple life and have a bond with the sea by making a living from the sea. Along the way we will make some interesting stops for photos, learning the finer details of the area. Parts of the tour will have some small hills but can be challenging on a humid day, but your rewards are the stunning view of the handful of those fantastic islands. After the biking trip a Thai-Lunch will be served at a bungalow or restaurant. After lunch, there is time for swimming or more adventures on the Bike Tours before heading to Phuket. Tour Includes : Hotel pick-up/return, mountain bike with 21-24 gears, helmet, English speaking guide, lunch, fruits, snacks, coffee, cold and drinking water. Prepare yourself : this tour is a soft adventure tour type which allow you to see local life style, cultures etc. Some part of the transportation may not comfortable as regular tour such as the local boat with huge engine will make very loud noise, the seat on the boat is the harden wood one and some routes of the tour are low hills So prepare yourself for some fun ready for some challenging!